I love how this album starts out with a southern gospel foot stomping “My Feet Are on the Rock.” It’s the kind of song that gets your blood a pumping and your praises running high. That’s followed up by an equally powerful praise song “To the One.” In fact, after previewing the album on iTunes on a few occasions I have found that I rated every track with 4 stars. I listen to projects like this on multiple devices and typically mark those I really like randomly, so I know what to give a good listen to as I write a review. Apparently, over time, I marked each and every track on “Trial & Triumph” with four stars. I think what made a huge difference is that they can switch around the leads quite easily. They have a nice combination of vocals that makes for a good variety of ambiances from song to song. Therefore, finding a few stand outs is very difficult, but overall, I was drawn to the tender tones of songs like “The Water” and “Near to Me.” These two speak to the “weak and weary” ways which we struggle with each day, but the lyrics speak of “hope,” “justice,” and being filled with the holy spirit. These two in particular are very uplifting and beautiful songs. 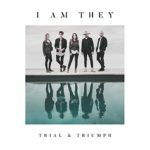 For more on “Trial & Triumph” check out the official I Am The website at https://www.iamtheyband.com/. This entry was posted on Monday, April 9th, 2018 at 7:39 pm and is filed under CD Reviews . You can follow any responses to this entry through the RSS 2.0 feed. Both comments and pings are currently closed.